Right across the street from one of Oahu's most beautiful and uncrowded beaches voted # 1 in the USA in 2015 . Enjoy the breathtaking beauty and peaceful tranquility of this perfectly located Hawaiian style cottage, steps from the beach with a large deck to enjoy the weather and the ocean breeze; The yard is tropical with an authentic Polynesian hut hosting the grill and a large play ground for the kids to play in a totally gated environment.. Boogie boards and beach equipment are there for you to enjoy . Inside the house everything is there to make you feel at home with a fully equipped kitchen, a small living room that can sleep two kids and what we call a sun room with a comfortable sofa that converts into a extra bed . The bedroom is air-conditioned and has a comfortable queen size bed and a large bay window that opens on to the deck. This colorful,sunny and breezy cottage is a guaranty that you will bring home lots of good memories and be charge up for the winter. You fall asleep with the sound of the ocean and wake up to the birds' chirping and gorgeous sunrise above your windows. There are several activities in close proximity including Sea Life Park (where you can swim with the dolphins and enjoy Chief's Hawaiian Luau with fire dancers). Or you can hike an easy trail up to the Makapu'u Lighthouse where you can whale watch in the winter months. Along a 10-minute breathtaking coastal drive you' can stop at Makapu'u and Sandy Beaches (watch or go boogy boarding), Blowhole, Hanauma Bay (Snorkeling) and arrive in Hawaii Kai with great restaurants, shopping and all sorts of activities from boating, jet-skiing, para-sailing, golf, etc..
A 30-40 minute drive will take you to Pearl Harbor, Downtown, Waikiki and Ala Moana Shopping Center. A 45 minute drive will take you to the North Shore and Haleiwa. The countryside of Waimanalo is slow moving and filled with Aloha. Once again you will not regret this Vacation rental only steeps from one of the world's top rated ( and uncrowded) beaches on Oahu. It's truly Hawaii's best kept secret location. Come join and experience Hawaii . We bought this property because it reminded me of Tahiti with luxuriant vegetation, beautiful green turquoise water and mountains on the back ground of Waimanalo are just majestic. We really enjoy sharing our place with our guests and will make it a point to give you the best possible advices to make you feel at home. We have started this Bed and Breakfast 13 years ago and have made countless number of happy customers.Our State Excise tax and accommodation tax Number W 00678258-01 are both added to the highly rate as well as a one time cleaning fee. The cottage is roomy and the kitchen will allow you to go wild like making your own bread and prepare your favorite recipe. The large deck outside make you enjoy the beautiful garden with breadfruit, coconut trees and lots of flowers. It has one Bedroom and a small extra room attached to the living room which can be cozy reading room or or a small bedroom. Outside we have arranged a hut Tahitian style with a weber BBQ and lounge chairs . Being a step away from one of the most beautiful beach in Hawaii in a very peaceful and green surrounding. This Bed and Breakfast will also offer you a complementary Fruit basket and snacks for your late arrivals . Directly across the street from the beach at less than 100 yards . The house is located in a peaceful country side on the east side of the island across the street from the beach . 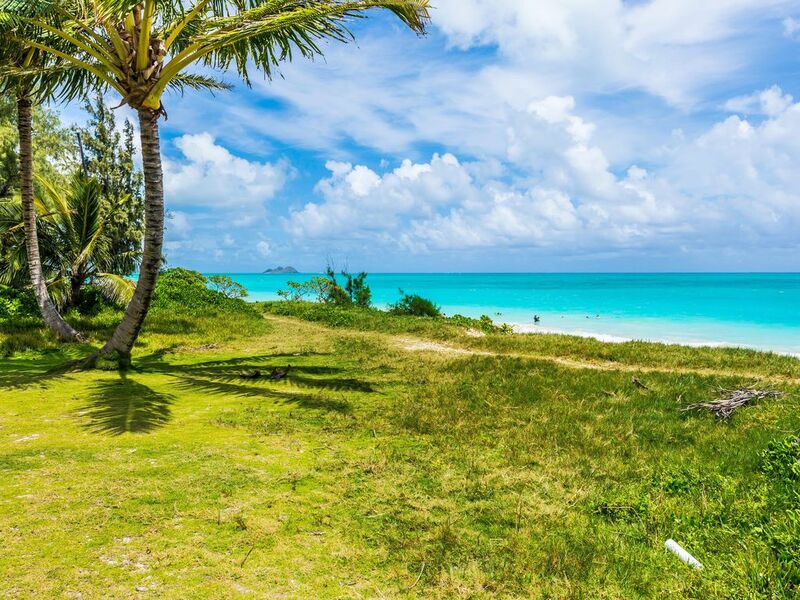 You will enjoy the sun rise and long walks on the sand searching for shells and glass balls ... Also close by are the nicest trails on the island starting from the backside of Waimanalo .